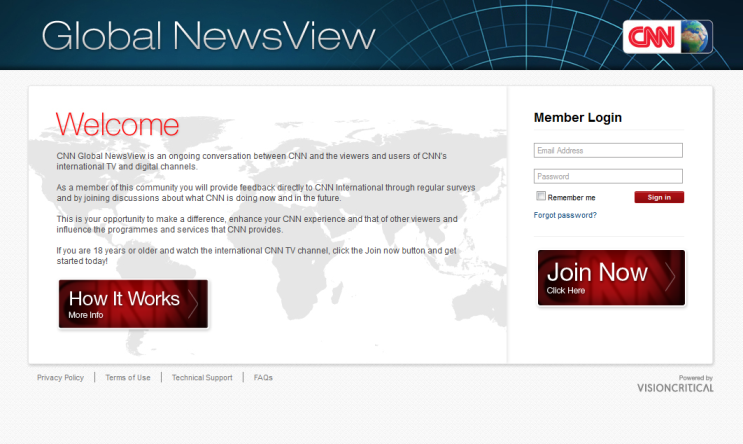 CNN International has partnered with Vision Critical to relaunch its Global NewsView survey. Unveiled just over a fortnight ago, the new CNN Global NewsView survey continues to invite CNN International viewers to participate in regular discussions on the network's programming and news coverage. There doesn't seem to be any indication of how regular new surveys will be available at this stage, but the previous partnership with market research company GfK produced a survey each week. As with the previous incarnation of the CNN Global NewsView survey, permanent residents of the United States attempting to register will be denied membership. The reason, according to the website, appears to be an attempt to avoid confusion with CNN's domestic operations. "This panel is aimed towards viewers of the CNN International TV channel (not CNN or HLN shown in the USA) so at this time, we are not accepting new memberships from permanent residents of the United States." CNN International viewers who reside outside of the U.S. can register for the new survey here.